City of Heroes reportedly has a new world-shaking challenge hitting the game: developer layoffs. Rumor has it that Paragon Studios, the developer currently handling City of Heroes, has just suffered a round of layoffs. Among those supposedly let go is Christopher Bruce, senior animation lead for Paragon Studios and alter ego of The Back Alley Brawler. 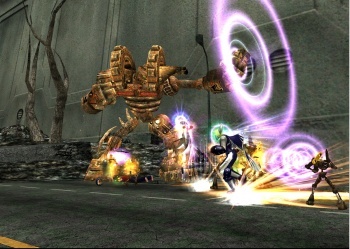 The studio recently released Going Rogue, the latest box expansion for City of Heroes, which provided some major changes to both its setting and gameplay mechanics. Before this, it was rumored that Paragon Studios was actually hiring people to work on a new project (presumably a sequel to City of Heroes). Exactly why these layoffs occurred hasn't been revealed. NCsoft has yet to actually confirm the layoff rumors and who - if they're true - has been let go.